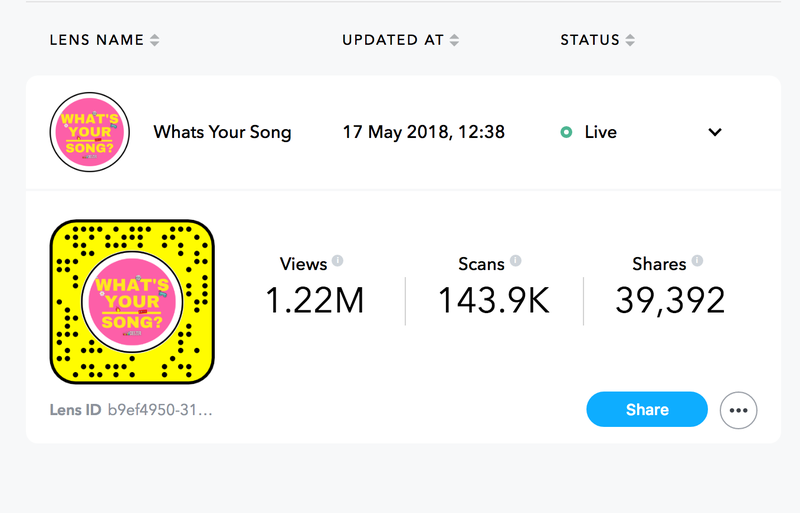 UK-based Fanbytes, a music-focused Snapchat Influencer network, has launched Fanbytes AR – a platform which helps brands create and distribute Snapchat Lenses at scale. For those not in the know, a Snapchat Lens is an augmented reality (AR) creation which allows the service’s users to install a bit of fun fakery into their images. With Snapchat’s global active user base standing at 188 million, it’s no surprise that brands, including record labels, want to make their own Lenses. Towards the end of last year, Snapchat introduced Lens Studios, which theoretically makes it easier for brands to create their own Lenses on the service. However, Fanbytes posits that many labels don’t have the creative expertise to make these Lenses. Crucially, says Fanbytes, labels also typically lack the tools required to attract widespread engagement with their branded Snapchat content. Fanbytes has previously worked with the likes of Warner Music, Deezer and Universal to maximise these companies’ presence on Snapchat. The firm offers its clients a network of vetted designers who can create AR Lenses for a fraction of the cost of a conventional agency. These lenses are then distributed through Fanbytes’s network of influencers and communities which create organic and viral engagement. The alternative, argues Fanbytes, would be for a brand to pay a premium price to Snapchat itself in order to achieve a prominent position within the service’s AR Lens categories. “It’s no secret that Snapchat is a very young platform. If you want to create something which could be engaged with then it’s got to come from a younger audience,” he says. Deezer recently used Fanbytes’ network of designers and influencers to create and promote an AR boombox which danced in accordance with music played in the background. This creative clocked over 1m views within 24 hours. This was then followed up by another Deezer campaign, which not only clocked over 1m views but also became a No.2-trending Lens on Snapchat. Bianca Spada, the global head of social media for Deezer, commented: “The campaign with Fanbytes beat all of our expectations in such a short amount of time and we continue to look for innovative ways to engage with millennials in 2018 and beyond. Warner Brothers Records recently used the Fanbytes designer community to create content for their artist Saweetie through Fanbytes Lenses and then distribute through their influencer network. Playing on the lyrics of Saweetie’s song ‘Icy Girl’, Fanbytes created a Lens which rained diamonds and, when tapped, turned into raining money. This Lens also ended up netting over 1m views within 3 days. Elissa Ayadi, VP of Fan Engagement at Warner Bros Records says of the campaign: “With Fanbytes, you can take advantage of their expertise in building a Lens but also have a distribution platform to reach younger audiences. My music startup failed multiple times before we got it right. Here’s what I learned.